The Medan Media Center with the sponsor of the Internews organized a two-day workshop for 30 journalists in Medan on 28-29 June. They invited Bambang Bujono and me to help lead the workshop. Bujono is the chief editor of the now defunct D&R weekly magazine. Maskur Abdullah, a BBC Section Indonesia correspondent in Medan, also helped run a session. Maskur is also the coordinator of the Medan Media Center. 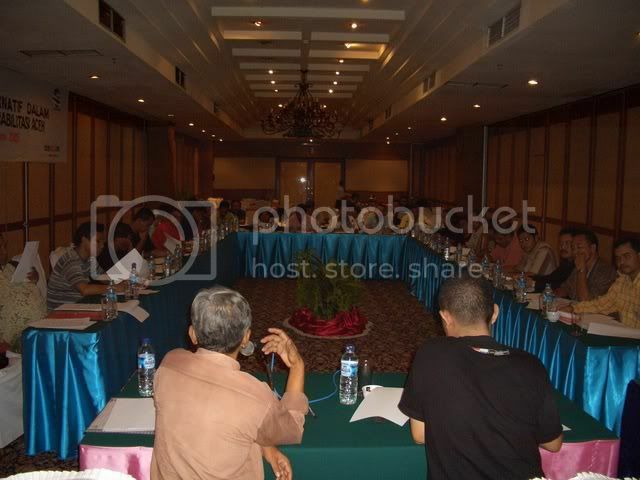 It is a project of Medan's Alliance of Independent Journalists. The participants were mostly Aceh journalists with only five coming from Medan. The workshop was designed to select 10 of them to conduct indepth reporting. Bujono had to evaluate all of their proposals and chose 10. The Aceh reporters came from various places like Banda Aceh, Bireuen, Kutacane, Meulaboh, Lhangsa et cetera. They also worked for various media outlets such as Serambi Indonesia, Waspada, Analisa, Prima FM, Acehkita and others. The workshop was organized at Hotel Novotel Soechi in Medan's business area. Bambang Bujono (brown shirt) and moderator Parlindungan Sibuea (black shirt) addressed the workshop. We had good meal, good hotel rooms and each participant got some perdiem money (I disagree with this practise but I did not know it until the last minute).